Sometimes life does this thing where it seems that three hundred disparate threads have suddenly become interwoven into this picture that becomes so suddenly clear. That’s been happening to me lately. Thread 1. Twitter – I keep finding all these amazing people there. Thread 2. Running – I have just started running, and all these runners have suddenly appeared. Thread 3. Faith – These people I’m meeting, these runners, they are people of faith like me. Thread 4. Writing – These believing, running people are also writers . . . it’s like a community is forming before my eyes. 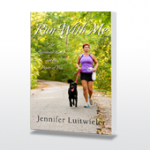 So when I read Jennifer Luitweiler’s book Run with Me: An Accidental Runner and the Power of Poo and came across the chapter where she describes how both her childhood church and running have taught her about community, I caught my breath like I do when something totally amazing shows up without any effort. . . like a hot pink sunset or a red-tailed hawk on my path. Another thread woven in. The book tells the story of how Luitweiler, in a quest to keep her dog from pooing in her studio, takes up running and finds, in the process, a way to cleanse her own system of the extra nonsense she carried. As even a novice runner, I could relate to this – the sense that things get worked out and worked off as we run. Jen’s book – we’re friends on Twitter now, so I think I can call her Jen – is insightful, interesting, and deeply funny. In fact, her writing reminds me a lot of Anne Lamott, and from me, such a comparison is high praise. There were moments as I was reading this book that I laughed out loud, and then just a paragraph later, I found myself leaning in to really get what she was saying. I’m not sure I’ll ever love running as much as Jen does, but I do love Jen’s writing . . . and if running brought me to that, then, I will put feet to pavement without question. You can learn more about Jen’s writing at her website, JenniferLuitweiler.com, and be sure to follow her on Twitter, too – @jenluit; her snarky, wise commentary keeps me laughing there, too.